*Rip DVD to Apple TV video with ease. *Get high quality video in H.264 and MPEG-4 format. *Select any subtitle and audio track on DVD for ripping. *Select the specific titles or chapters you want to rip. *Extract audio from DVD movie to MP3, WAV, AIFF, M4A format. *Rip any dvd movies and it is faster and more compitable than ever. *Custom define the output video and audio setting. *Crop DVD video to remove black bars. *Trim DVD title or chapter to convert your favorite clips only. *Add watermark to movie video. *Enjoy the built-in DVD player and take snapshot. *Save time with multithreading and batch DVD to Apple TV conversion. Qweas is providing links to iFunia DVD to Apple TV Converter for Mac 2.5.0.0 as a courtesy, and makes no representations regarding iFunia DVD to Apple TV Converter for Mac or any other applications or any information related thereto. 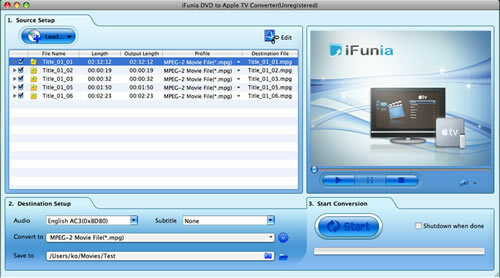 Any questions, complaints or claims regarding this application iFunia DVD to Apple TV Converter for Mac 2.5.0.0 must be directed to the appropriate software vendor. You may click the publisher link of iFunia DVD to Apple TV Converter for Mac on the top of this page to get more details about the vendor.